The 10′ x 6′ Shed-Plus Champion Heavy Duty Apex Single Door Shed offers you a very secure, long lasting and great looking structure to keep all your items safe, secure and dry. This is one of the standout sheds from this line in that it offers a very generous amount of storage space and a truly classy look that is very eye catching. The shed is very comfortable to be in thanks to the raised eaves and the height offered by the high ridge. This makes this a structure that would be equally as good as a workshop as it is a place just for storage. Included are two strengthened glass windows which actually open and a wide, legged and braced door to make taking things out and storing them back again no hassle at all. 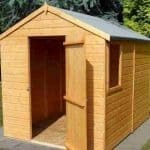 Shed-Plus have managed to make this a very fairly priced shed, but also make sure the materials used are very high quality. All of the timber that has been used in construction of this has been pressure treated to make the incredibly strong and be able to last for many years. This shed from the tongue and groove apex roof to the pressure treated floor joists is just top quality and holding it all together is 12 mm thick tongue and groove cladding and a strong frame. 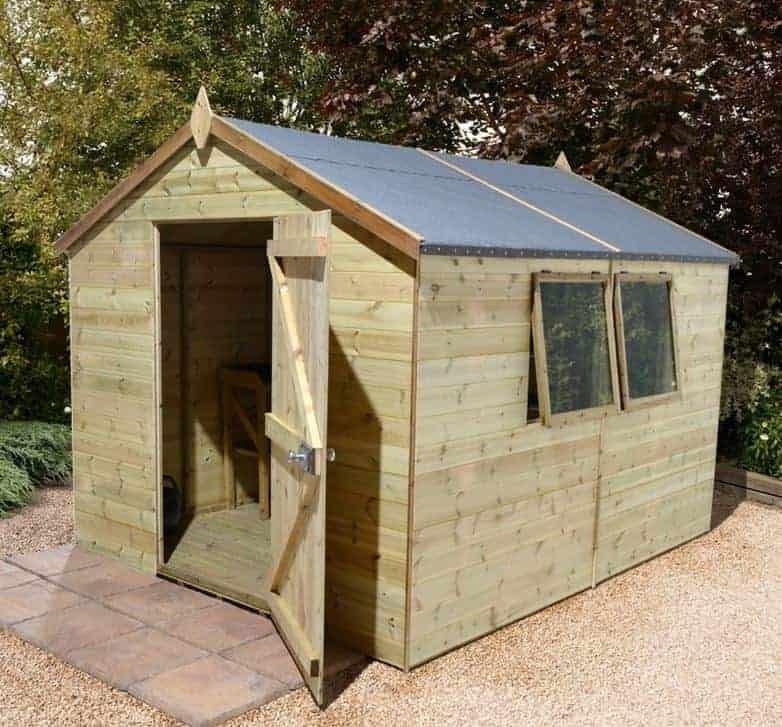 The Champion line is Shed-Plus’s heavy duty, high quality series of sheds and here we have a fantastic shed from that line which has a very cool design, strong build and just a lot of quality running through it. 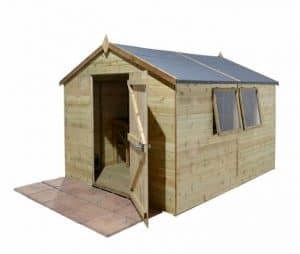 This is made with very high quality pressure treated wood to help make the shed last and the size of this is very interesting in that the depth is 9 feet 11 inches and the width is 6 feet. This gives the shed a very interesting shape and also sets you up with plenty of storage space. 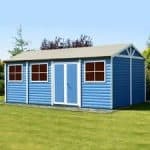 The height is something we know is going to impress many people this is because the Champion line of sheds has use elevated eaves which makes even the lowest section a very respectable, 5 feet 8 inches high. The high point of the shed is 7 feet 3 inches and that along with the eaves height, we feel will make being inside here very comfortable. The roof that Shed-Plus use on their Champion sheds is something that we really do like. This one has an apex roof that is made up with 12 mm thick, tongue and groove boards. On top of this we have some very heavy duty, mineral felt which will protect from rain, snow and the kids footballs and Frisbees that will inevitably hit the roof. 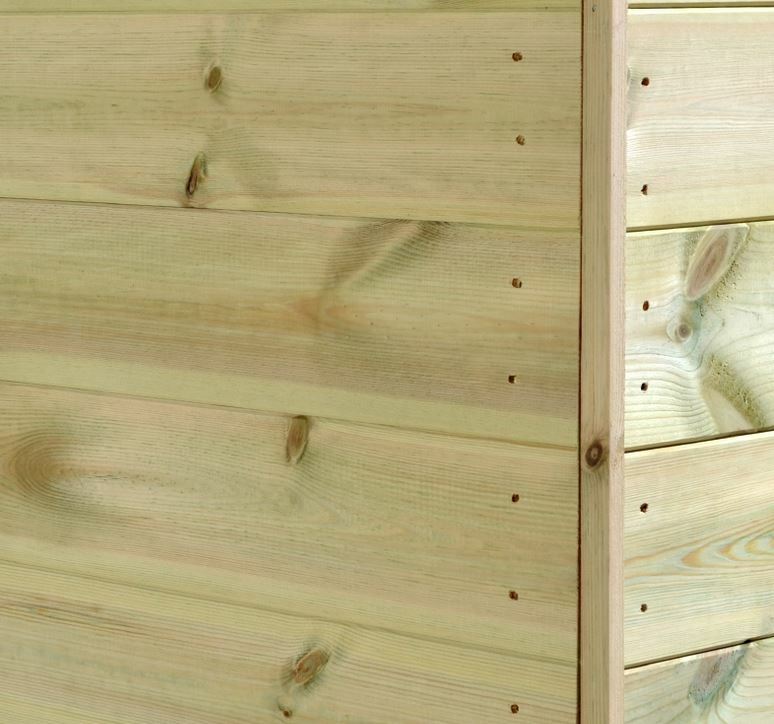 The 12 mm tongue and groove cladding is something that Shed-Plus take great pride in. The cladding is strong and thanks to being pressure treated it is going to be able to take many years of abuse from the weather. The timber that is used for the cladding as you can see from the pictures really does have a very smart and classy look to it which we feel will allow the shed to easily go into any style of garden. A huge reason as to why this shed is going to be still standing in your garden ten or twenty years in the future is the frame. The frame is a 34 mm x 35 mm frame that is very heavy duty and robust. To go the extra mile and really make sure this is a strong frame, Shed-Plus have used diagonal cross braces to help add extra strength. Like the rest of the shed the floor is very strong and made to last. The floor uses 12 mm tongue and groove boards which like the rest of the wood has been pressure treated. Now we feel these boards on their own are very strong and could take a lot of weight. But there is some pressure treated floor joists which will really make the floor secure and protect it from the ground below it. The pressure treated timber that is used here is fantastic, but you will still want to paint the shed yourself with wood treatment to really ensure that this is well protected and will not show any signs of decay. We do recommend that like with all sheds, you give this a yearly coating of treatment. The 15 year guarantee you get with this shed is possible because of how much faith, Shed-Plus have in their pressure treatment process. The door on the 10′ x 6′ Shed-Plus Champion Heavy Duty Apex Single Door Shed is very impressive in that it is fully legged and braced and is held in place with heavy duty hinges to prevent the door from starting to sag a few years down the line. 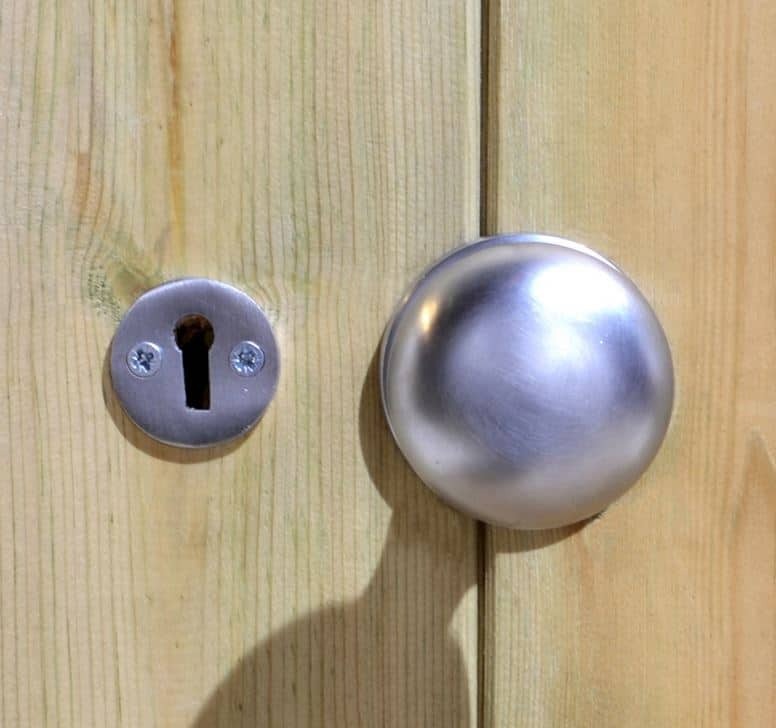 There is also has a door knob and a proper lock to make it convenient and easy to use. 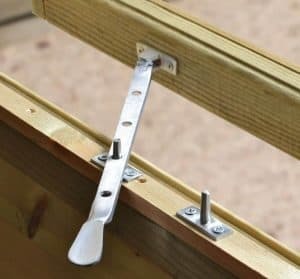 Getting into the shed is not going to be any kind of hassle as the dimensions of the door are impressive with the width being, 2 feet 11 inches and the height 5 feet 11 inches. One side of the shed has two good sized toughened safety glass windows. Both windows can be opened and this will allow fresh air as well as plenty of light into the shed. We do really like how they have used toughened safety glass as this would be perfect for families who have kids who love to play football in the garden. The Champion line of sheds do offer a lot of security because of how robust they are. The lock and key that is included is going to allow you to keep things like expensive tools and bikes securely locked away at night. We really do not have any concerns over the security of the shed, but if you did want to kick the security up a few notches then adding in some kind of pad bolt would not be that hard to do. You will find that this is a shed people will love to look at, which if it is friends or family you really do not mind, but for the random person walking down the street those large windows could make it easy to look inside. This though could be avoided by positioning the shed so the windows are not facing an open location or even with the help of a set of curtains. 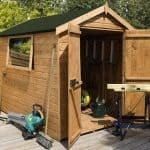 If you do want to customise the shed in order to give it a little bit of your own style or even make it so that it blends in with the rest of your garden better. The best way to do this is with coloured wood treatment. This way you can change the colour of the shed and also protect the wood at the same time. Shed-Plus do offer a few extras for you to consider. First of all they have their own installation service where for, £109 they will install the shed as well as delivering it. They also have a slatted roof which we do really love the look of, but it does cost a rather high, £249.99. The last extra available is ideal if you are using this as a workshop. There is a Shed-Plus branded workbench that they offer for £106.99. Shed-Plus do a wonderful job with this line of Champions sheds as they are very high quality in every way. The pressure treated timber is going to serve you very well. Just make sure you treat it and you will find this shed will look just as good in ten years’ time as the day it was built. We know the 6 feet of width may raise some eyebrows, but the depth more than makes up for this and gives you a whole lot of storage space. The raised eaves also mean you can store things higher as well. There is nothing too complex here that is going to cause you to cry or hit the ground in anger with a hammer. Just get a friend to help you, follow the instructions and have the kettle always on and you will be done in 2-4 hours. 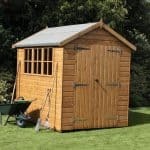 We feel for the quality and the storage space this is a shed which really does offer excellent value for money. Final Thoughts: This is a shed which we really do love the look of as it has such an impressive look. We are sure anyone looking at the pictures is going to be impressed with the design of this shed. You have a lot of floor space here as well as a lot of height so you can really stack things up high. 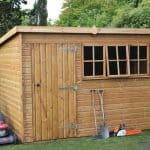 The secure design of the shed will make you feel comfortable in storing more expensive things in here like expensive gardening equipment or even kids summer toys. 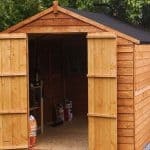 This is a line of sheds that really is impressive and if you do feel that you need quite a lot of storage space then this is a shed which we feel will serve you very well for many years.